Authority to supply a shiplift and trans- fer system valued at more than $7 mil- lion for the dry docking of Nile River cruise ferries. Circle 209 on Reader Service Card www.maritimetoday.com Maritime Reporter/Engineering News basis. The Syncrolift system provides the benefit of less time out of the water, which leads to cancelled cruises and loss of revenue. The order is the sixth Syncrolift instal- lation in Egypt — the other two are with the Egyptian Navy — bringing Syncro- lift's total worldwide installation to 221. Repair Sys- tem has been successfully used to repair a variety of leaks in marine and offshore applications, under- water cable, chemical plants, refineries, municipal water and wastewater utili- ties, electric utilities, irrigation, pools and spas, commercial, industrial, and municipal buildings; schools; hospitals; farms and many others since 1986. The included FIX STIX hand-mold- able epoxy is NSF certified and safe for use on potable water. Pipes are wrapped with a water activated knitted fiberglass tape, pre-coated with urethane, that can be applied by one person with no mix- ing, measuring or hot work. STOP IT sets in five minutes, cures fully in 30 minutes and conforms around elbows, tees and other fittings. The surface of the pipe does not have to be clean or dry, just rough. IT will withstand up to 400 PSI and 500° F and has excellent chemical resis- tance. It's the most reliable system out there. 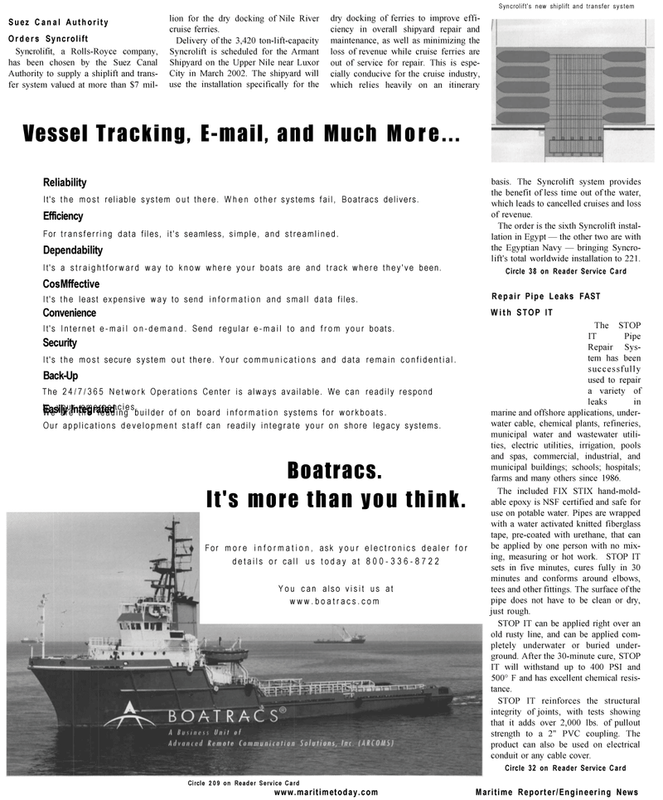 When other systems fail, Boatracs delivers. For transferring data files, it's seamless, simple, and streamlined. It's a straightforward way to know where your boats are and track where they've been. It's the least expensive way to send information and small data files. It's Internet e-mail on-demand. Send regular e-mail to and from your boats. It's the most secure system out there. Your communications and data remain confidential. The 24/7/365 Network Operations Center is always available. We can readily respond to your emergencies. Easily Integrated We are the leading builder of on board information systems for workboats. Our applications development staff can readily integrate your on shore legacy systems.